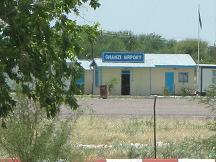 The Ghanzi Airport is located 1km from the town center. It has an Airport code of GNZ. The main airlines in Botswana and South Africa do not offer any flights to the airport at the moment. However you do have the option to charter a private plane from other cities and towns in Botswana to Ghanzi. Plans for a new airport in Ghanzi are under way and construction is said to begin mid 2009.This new airport will be located in the western part of the town. In the near future Air Botswana and other major commercial airlines will therefore have flights to Ghanzi. It is also a bonus for the town of Ghanzi and its residents. A larger airport will definitely boost tourism in the region.